You will have to write in BICYCLE many times on the survey questions. For example, to answer the question “What method(s) of transportation do you use during your daily commute? (Select all that apply. ),” Walking and Biking are listed together under Active Transportation. Walking and Biking are transportation modes that use different infrastructure. Biking should be its own method of transportation, particularly with such an extensive list that, for example, separates Carpool and Vanpool and has separate categories for Bus and Rapid. There are three comment areas on the survey to comment and reiterate that bicycling is extremely important. Let’s make our voices heard. “Technology is evolving and has the potential to radically change our region’s transportation system.” I am doubtful that technology will radically change the region’s transportation system away from a car-centric approach. Political will could radically change the system, but not technology. Additionally, there is some early research that indicates ride sharing services increase Vehicle Miles Traveled or VMT. 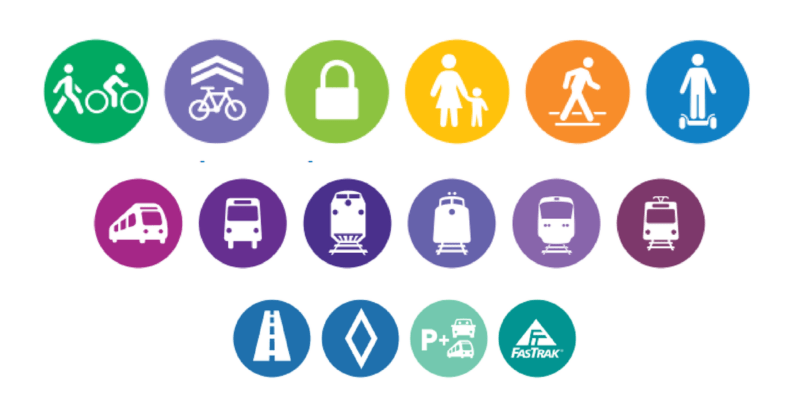 Overall the Transportation Themes lean heavily toward a continuing car-centric approach to transportation. The Regional Economic Prosperity Objective includes “investing in transportation projects that provide access for all communities to a variety of jobs with competitive wages.” And the Policy Objectives for Environmental Stewardship include making “…transportation investments that result in cleaner air, environmental protection, conservation, efficiency, and sustainable living and address climate change.” How do these two policies interact? How is success measured for these policies? On the poster “Reducing Greenhouse Gas Emissions: Passenger Vehicles and Electricity,” the regional plan calls for allocating funding to electric vehicle charging stations while the “Local Efforts” poster calls for promoting public transit access, active transportation, parking management, and complete streets.